Elon’s music education program prepares graduates with the essential knowledge, skills, and cultural awareness to teach in the diverse 21st century classroom. 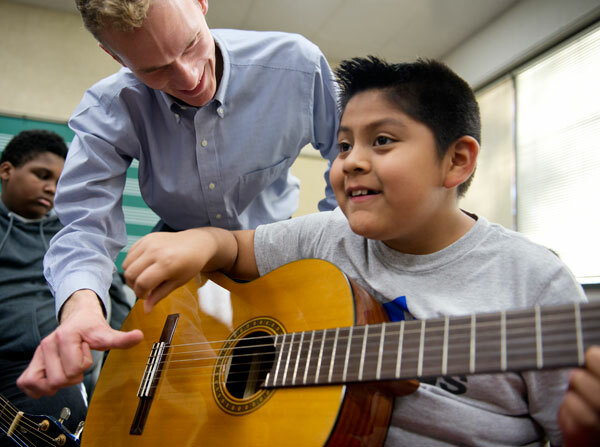 The music education program instills and nurtures a commitment to first-rate teaching, lifelong creative expression, and the willingness to be enriched by and value the many and varied musical cultures found in the communities in which they will serve. Music education offers a comprehensive curriculum wherein skills and knowledge gained in one course continue tobe utilized and refined as students move through theory, conducting, and methods courses. 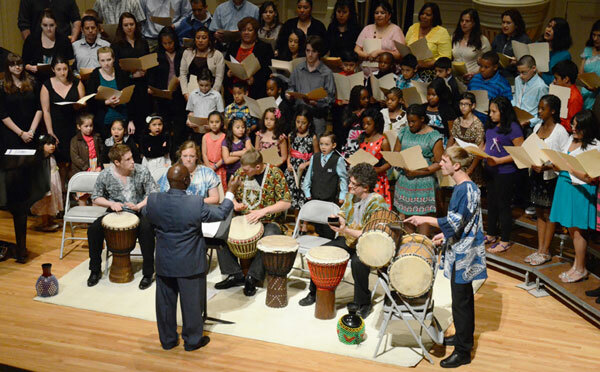 This integrated approach, in addition to providing tremendous confidence, is the foundation on which our students are prepared to be excellent educators, creative musicians that continue to perform, and practitioners that will honor the cultural diversity found in the communities that they will serve. In our primary goal of preparing our students to be excellent teachers the curriculum is devised to engage students in activities, discussions, and other forms of reflection and inquiry providing educational experiences that advance students toward moments of discovery and greater clarity of course content, self, and others. 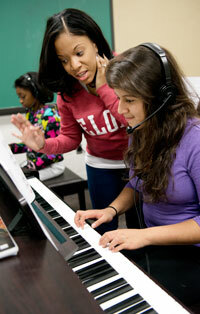 Our students thrive in an environment that fosters high levels of musicianship and performance ability. In addition they develop critical thinking skills that advance their perceptions, sensitivities, and beliefs while enhancing their awareness and understanding of others, who they are, and what they have to offer in a classroom. We believe that this kind of educator can design and implement experiences that demand the highest standards in the classroom while honoring every student and the life experiences they bring to the process of learning. In the spring of 2013 the Coordinator of Music Education founded a new and exciting program called “Music in the Village”. This program evolved out of the “Village Project”, a program created in the School of Education designed to strengthen literacy skills for elementary and middle school children. Music in the Village is a service-learning community outreach program designed for elementary to middle school aged children and their parents that teaches musical literacy and supports the literacy mandate of the “Village Project”. Music education students can participate and teach in this program in each semester of residency except the semester of student teaching. This Village experience provides the opportunity for prospective teachers to not only develop teaching skills and strategies, but it gives them invaluable insight into how to foster meaningful relationships with parents. Parents are a crucial component of Music in the Village as they attend classes with their children. Elon’s collegiate chapter of the National Association for Music Educators earns the “Chapter of Excellence” awarded by the National Association for Music Educators. 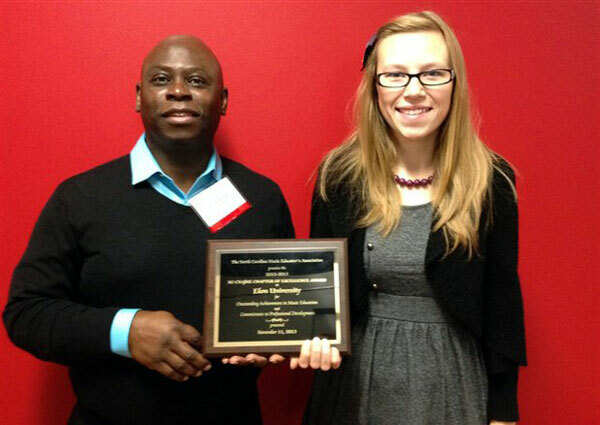 The chapter received the “Chapter of Excellence” award from the North Carolina Music Educator’s Association last year. To be recognized by the National Association for Music Education and the North Carolina Music Educator’s Association is a tremendous honor that gives us a sense of accomplishment. However, it also reminds us of the immense value in being strongly connected to the community, the worth of our efforts to make a difference, and the work that still remains to be done. Students work hard in difficult classes, spend long hours practicing their instruments and attend or are involved in almost every cultural event on campus. But it is well worth the work to graduate knowing you are fully prepared for whatever teaching has to offer. *Auditions are required for admission to the music education program and for scholarship consideration.